The Central Energy Plant on Rutford Avenue will get some routine maintenance over the winter break leaving a number of buildings without heat. Fortunately, the campus will be closed for the holidays. Crews are set to begin updating the patio off McDermott Library’s basement. Among the improvements are new lighting fixtures and the addition of electrical outlets to allow students to plug in devices while studying outdoors. Work is scheduled to begin Friday, September 21, on a project to update the patio off the basement of McDermott Library. The project has two parts. Crews will begin breaking up tile and concrete to install new light fixtures and add electrical outlets so that students, faculty and staff can plug in laptops or other devices while outside. This portion of the project is scheduled through Friday, October 5. During this phase, the patio still will be accessible but people are asked to exercise caution when traveling near the project area. Plans also call for tiles to be replaced with new flooring and for the patio to receive new outdoor furnishings. This will begin shortly after October 5 and will take up to three weeks to complete. Doors leading out toward the patio will be closed, and the large staircase from the patio that leads to the trellis will be barricaded to keep traffic away from the project area. For more information, contact Walter Welch, superintendent of electrical services for Facilities Management, at 972.883.2218. Due to inclement weather on Sunday, construction activity on the southeast portion of the campus mall was not able to be completed. Pedestrian access to the campus mall will continue to be restricted on Monday, September 17, to allow for completion of the project. 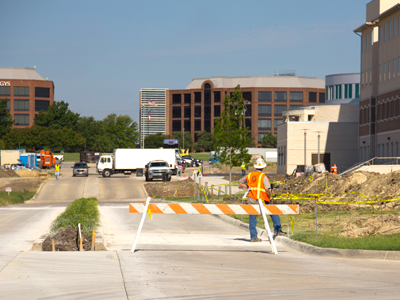 The campus mall will be closed from just south of the library to the north end of the Naveen Jindal School of Management (JSOM), except for a sidewalk on the west side. The library will remain open, and the JSOM will be accessible from doors on the south side of the building. The campus mall will be closed from just south of McDermott Library to the north end of the Naveen Jindal School of Management (JSOM), except for a sidewalk on the west side. The library will remain open, and the JSOM will be accessible from doors on the south side of the building. Crews put down rebar and wood framing for a sidewalk along the west side of Drive H. The project will feature curb cuts to assist students, faculty and staff using wheelchairs, scooters, skates and other personal transportation devices. 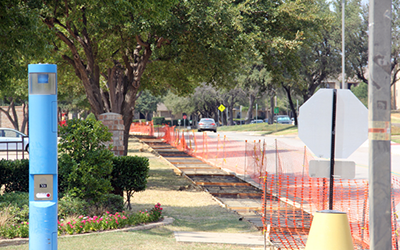 Crews will begin building a new sidewalk along the west side of Drive H the week of Monday, July 30. The construction project is expected to take three weeks. Avoid using Drive H if possible. Barricades and flag men may block or redirect pedestrian and vehicular traffic for short periods of time when needed. All are asked to exercise caution when traveling in the area. For more information, contact Sam Eicke, assistant director for Facilities Management, at 469.387.0418. Crews will shut down power to the Engineering and Computer Science Complex, the Activity Center and the Visitor Center and University Bookstore from 4:00 a.m. to 7:00 a.m. Saturday, July 28. 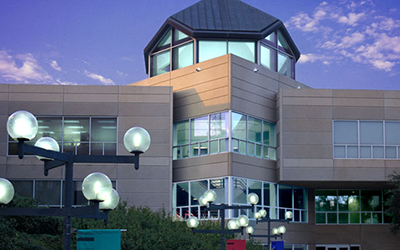 A power outage is scheduled for 4:00 a.m. Saturday, July 28, at the Erik Jonsson School of Engineering and Computer Science, the Activity Center and the Visitor Center and University Bookstore. The outage is needed to install new meters and a feeder line to the Activity Center. Power will be restored around 7:00 a.m. Before leaving campus today, please turn off computers and any sensitive equipment to prevent loss of critical information. For more information, contact Walter Welch, electrical services superintendent for Facilities Management, at 972.883.2118. Crews will begin this week to remove an abundance of lotus pads and silt that threatens to impede the flow of drainage water. A silt removal crew will begin on Monday, July 23 to clear out and dredge a storm drainage retention area near Lot C and Lookout Drive on the UT Dallas campus. Dredging will remove an invasive outgrowth of lotus pads and silt that block the flow of water and could cause potential flooding in campus sewer systems. The process should take 10 days and will increase capacity for storm drainage. The area, between several pedestrian pathways that lead from Lot C to the campus, will be barricaded beginning July 23. UT Dallas facilities management staff will slowly drain the site’s water on Wednesday, July 18, to allow minnow-size fish and turtles to escape before dredging begins. While pedestrian walkways remain open, passers-by may notice an odor once the project starts. The smell is caused by bacterial breakdown of organic matter in stagnant water sites such as swamps and sewers. Removal crews will transport the silt in trucks to a compost heap site in a field off Synergy Park Boulevard. The silt will add important nutrients to campus composting operations, which will then be used on University landscape projects. For more information, contact Kelly Kinnard, director of physical plant services for Facilities Management, at 972.883.2141. A flagman stationed southeast of Residence Hall 3 warns drivers that the Loop Road is closed for an eight-week construction project. Parking lots for Residence Hall North and South, however, will remain open. 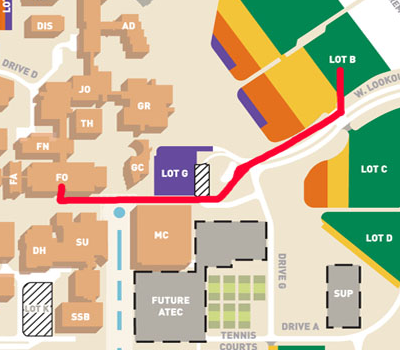 The western portion of the Loop Road —just beyond Residence Halls North and South— will be closed Monday, June 25 through Monday, August 20 as crews expand utility and chilled-water service to Residence Hall 3. Driveways and access to Residence Hall North and South parking lots will remain open throughout the eight-week project. Drivers are asked to be extra cautious when traveling through the area. For more information, contact Kelly Kinnard, director of physical plant services for Facilities Management, at 972.883.2141. Lamp posts across campus and light standards in parking lots will go dark early Saturday morning as crews install power meters in the electric rooms of Green Hall and McDermott Library. A power outage is scheduled from 4:30 a.m. to 7:00 a.m. Saturday, June 16, that will affect the University Theater, McDermott Library, Green Hall and the Cecil and Ida Green Center. New power meters will be installed in the electric rooms of Green and McDermott. All outdoor lights in parking Lots A, B, C, D and G, as well as the lamp posts along Lookout Drive, the eastern portions of Drive A between the Activity Center and Armstrong Drive, and on the Mall between the Administration Building and the Activity Center, will be affected by the outage. Students, faculty and staff are asked to ensure that all computers and any sensitive equipment are turned off Friday evening to prevent the loss of critical information. For more information, contact Matt Lanty, electrical shop foreman for Facilities Management, at 972.883.2114. The north entrance to Lot M West will be closed until June 5. Use Lot M East to access Lot M West from the south. The entrance to Lot M West near the Naveen Jindal School of Management is closed during repairs to the parking lot. Drivers can enter Lot M West from the south using Lot M East. The lot will remain open while work is in progress, but drivers can expect some temporary loss of parking spaces because of the repair work. Parking patrons are asked to use caution and observe safety signs and barricades around the affected areas. The work is scheduled to occur in stages and will require about 60 days. For more information contact Nick Argueta, P.E., Facilities Management Project Engineer, 972.883.6834. 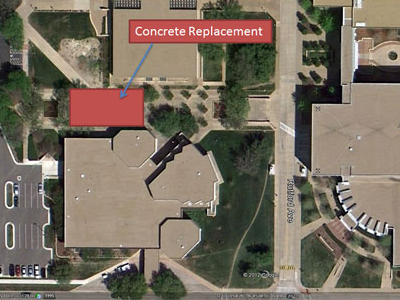 Concrete between the Alexander Clark Center and Hoblitzelle Hall will be replaced starting Tuesday, May 29. 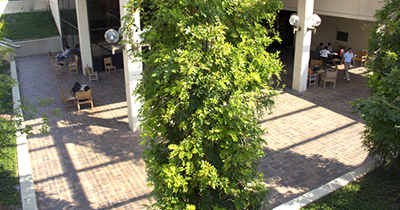 The grounds crew will remove diseased trees in the mall area between the Alexander Clark Center (formerly Conference Center) and Hoblitzelle Hall starting May 21 to May 23. In addition, crews will replace the concrete in the same area beginning May 29. Sod replacement in the mall area around the fountains will begin May 21 and continue through June 5. For more information, contact Jay Jascott, landscape supervisor, at 972.883.2311. Spring Commencement will be held in the Activity Center on Friday, May 18, and Saturday, May 19. Very large crowds are anticipated. Traffic on and around campus will be heavy both days from 8&058;00 a.m. to 6&058;00 p.m. To ease traffic and parking issues during the ceremony times, faculty and staff are asked to approach campus from the north and park in Lots A and B near the intersection of Synergy Park Boulevard and North Floyd Road. This offers direct access to campus and allows for less-congested departures. Your support in this matter will ensure that parking options around the Activity Center will be available for our graduates, families and guests. 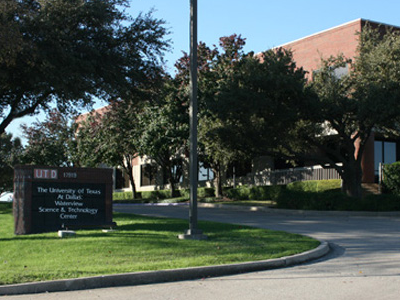 Parking Lot M West near the Naveen Jindal School of Management will undergo repairs that may delay drivers and temporarily cost them a few spaces starting Monday, May 21 through mid-summer. 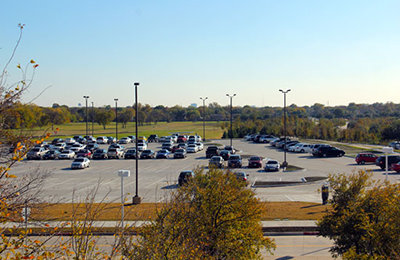 Starting Monday, May 21, portions of parking Lot M West near the Naveen Jindal School of Management will be under repair. The lot will remain open while work is in progress. Still, drivers can expect some temporary loss of parking spaces because of the repair work. Parking patrons are asked to use caution and observe safety signs and barricades around the affected areas. The work is scheduled to occur in stages and will require about 60 days. Water service in the Jonsson Academic Center (left) and Lloyd Berkner Hall (right) will be disrupted for up to 12 hours on Saturday and Sunday, respectively, March 17 and 18. Water is scheduled to be shut off in two campus buildings over the weekend. 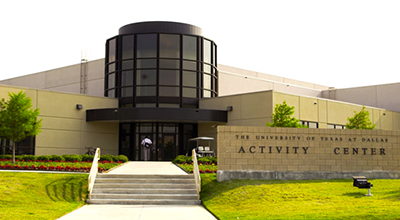 Crews will shut off water to the Erik Jonsson Academic Center starting at 6:00 a.m. Saturday, March 17. The water will be off for as little as six hours and as many as 12 hours. Crews will be placing a valve on the main water feed to the building. Likewise, water will be shut off in Lloyd V. Berkner Hall starting at 6:00 a.m. Sunday to add a similar valve to the building’s main water feed. Water service should be fully restored to both buildings no later than 6:00 p.m. Saturday and Sunday, respectively. For more information, contact Joe Jennings, facilities management plumbing, at 972.883.2121. The Waterview Science and Technology Center (WSTC) will go dark from 7:00 a.m. till 5:00 p.m. on Saturday, March 17, as crews install an emergency power generator. An electrical outage has been scheduled at the Waterview Science and Technology Center (WSTC) from 7:00 a.m. till 5:00 p.m. on Saturday, March 17. Crews will be connecting an emergency power generator to the building’s electrical system. For more information, contact Walter Welch, facilities management electrical superintendent, at 972.883.2118. The red line represents the helicopter’s scheduled flight path Sunday, February 19 for delivery of equipment to Founders. A helicopter is scheduled to pick up and move heavy mechanical equipment to the roof of the Founders Building on Sunday, February 19, to facilitate completion of the building’s third-floor renovations. The equipment will be staged in parking Lot B, where it will be hooked up to the helicopter and hoisted southwest along Lookout Drive before flying west along Drive B to Founders. The building’s occupants and pedestrians are asked to stay clear of the east side of Founders and Trellis area between 7:00 a.m. and 12:00 noon Sunday. The equipment will be lowered onto Founders’ roof, where crews will be waiting to receive and move the parts into the building. With a simple swipe from a credit or debit card, anyone can pay for a parking space on the UT Dallas campus. 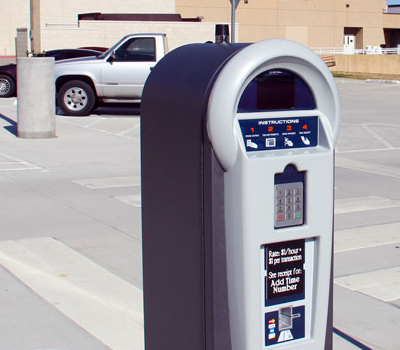 UT Dallas is now using Pay-By-Space kiosks, electronic cashless parking meters, in parking lots F and K, and portions of Lots G, I and M. Anyone may use a Pay-By-Space spot. No visitor pass or parking permit is required to park in one of these specially-designated spaces. Pay-By-Space kiosks accept credit or debit cards bearing the Visa, MasterCard, Discover or American Express logo for payment. The cost to park in a Pay-By-Space lot is $1 per hour plus $1 per transaction. The new pay stations replace the individual meters previously used in various parking lots on campus. Electronic payment provides convenience to drivers who may not be carrying cash and allows the University to save labor costs involved with emptying the coin-operated machines. For more information, contact Parking and Transportation (972.883.7777 / park@utdallas.edu). There may be some minor periodic traffic disruptions along Rutford Avenue and Drive E, but most of Lots E and L will remain open for parking. 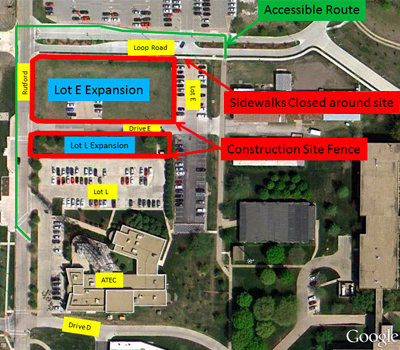 A construction project to expand parking Lots E and L begins Monday, January 23. Most of Lot E will be fenced off but its eastern portion and all of Lot L will remain open. Drivers and pedestrians are asked to be careful when passing the site. The construction is expected to take several months to complete. Contact Nicholas Argueta, P.E., project manager for Facilities Management, at 972.883.6834 for more information. 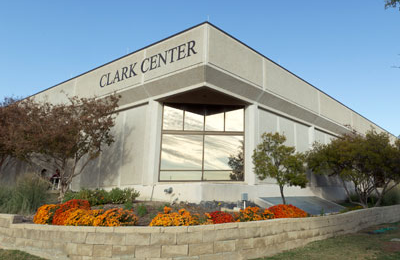 Pruning and removal of diseased trees near the Alexander Clark Center (formerly Conference Center) begins this week. 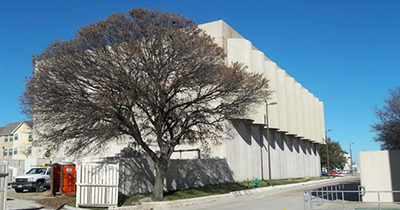 Diseased trees suffering from Oak Wilt near the Alexander Clark Center (formerly the Conference Center) will be removed this week, beginning on Wednesday, January 4. Oak Wilt is caused by Ceratocystis fagacearum, a fungus that invades and colonizes the water-conducting tissues in healthy oak trees. The tree’s reaction to this invasion blocks the water-conducting tissues and, ultimately, results in severe die-back (deadening which begins at branch tips) or tree death. If diseased material is left in place, fungal spores from dead trees can spread and cause further damage. Reforestation of similar-size trees is planned for the area. For more information, contact Jay Jascott, Facilities Management landscape supervisor, at 972.883.2311.